we have gathered information about. For more information about and images of some very old presses and equipment, we recommend Stephen O. Saxe's Flickr Photostream. The Excelsior Press began with one 3x5 Kelsey Excelsior - hence the name of this 12-year-old's new printing business - in 1962. By 1964, I was ready to move on to a "real" printing press and acquired an 1870-80's treadle operated 9x13 Gordon - made by Damon & Peets of New York, and an 8x12 C&P Early Series made prior to 1911. We still use the Gordon for scoring on a regular basis. See Video of Sarah & Jennette scoring cards on it. The 10x15 C&P was acquired from a school-mate's father in 1967, and is still in use today. This is the press featured on the first half of this hand press video by Sugar Moon Productions. In 1980, I finally realized the dream of my earlier life - to own and operate my own Heidelberg Windmill Platen Press. I had learned to operate the Windmill during the summer of 1966, while attending a summer course in printing at Jonathon Dayton Regional High School in Springfield, NJ. Once I had mastered the skill, I began employment as an operator in a dingy basement print shop in Plainfield, NJ. In 1968, during the months preceding my enlistment in the USAF, I was pressman on a Windmill at Lawrence Printing Company, in Morristown, NJ. But it wasn't until 1980 - when I bought this press (for $4500) from P&D Bindery in Dunellen, NJ, that I finally owned my own 10x15 Heidelberg Windmill Platen Press, which I have used constantly - and continue to use regularly to this day. "What a Press!" Ironically, business at The Excelsior Press was so brisk at that time, that I had to hire Greg Daniels as pressman to keep up with the work. At that time, the Excelsior Press had a total of 7 employees and ran two shifts a day - and I got to work both shifts! This particular Star is currently awaiting a new set of rollers, a custom-made treadle, a set of feed table arms and a feed table. It has a very interesting impression mechanism - which seems to have been overstressed at some time in the past; there is a large brazed repair visible on the main rocker shaft. 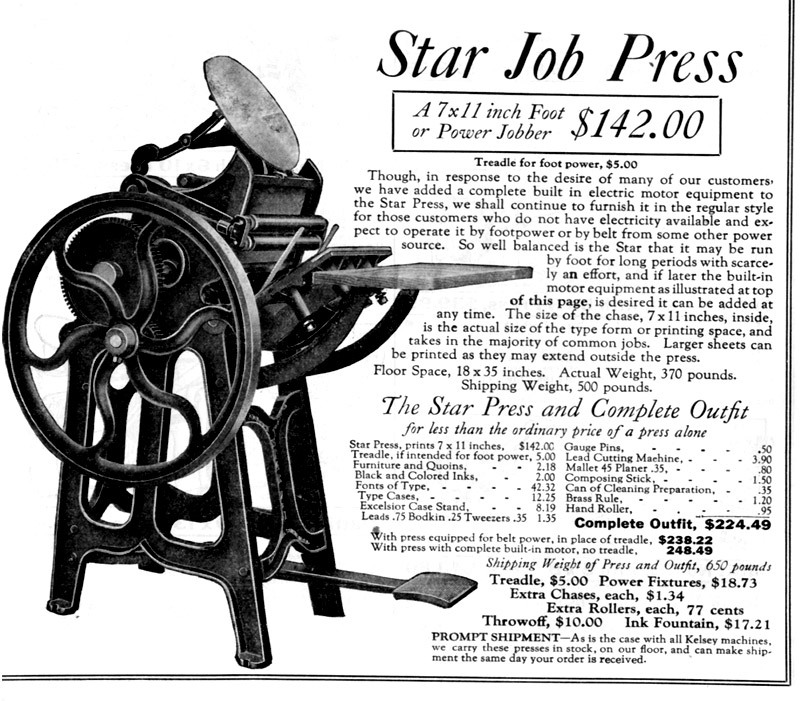 An old Kelsey Advertisement for the Star is shown below. Since then, we've acquired our "twice rescued Pearl" from the son of Mr. Orlin Van Duyne - and an original 1873 design Kelsey Excelsior 3x5. We have also been selected as curator for a Daughaday Model Press which belongs to the NJ Agricultural Museum. They have lost their funding due to Gov. Christie's budget cut-backs and had no place to keep this classic press... until they found us.